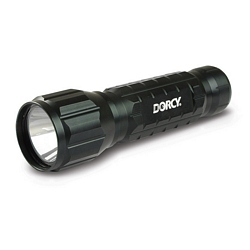 Equipped with a 120-lumen Luxeon LED from Lumileds, Dorcy's high-power Metal Gear 3AAA LED flashlight delivers the illuminating intensity of much larger (and heavier) flashlights in a compact 5-inch-long aluminum housing. It will deliver two hours of intense light with one set of batteries... and the bulb is guaranteed to last a lifetime. The convenient tail cap push button switch minimizes accidental activations while in storage. Includes 3 AAA batteries and nylon holster.